Invercargill mayor says that a defamation case in which he was found not guilty the local government equivalent of the David Lange defamation case. The case pitted a city councillor against her mayor (and the local newspaper). A jury on Friday found Mr Shadbolt and the Southland Times newspaper not guilty of defaming Karen Arnold in a series of columns in 2014 and 2015. Ms Arnold had argued she was portrayed by the mayor in the columns as unprofessional and a leaker of confidential documents. Mr Shadbolt said the verdict was highly significant for freedom of speech. Mr Shadbolt said his case was the local government equivalent of the David Lange defamation case 20 years ago. Invercargill City councillor Karen Arnold had sued Shadbolt and Stuff, formerly Fairfax Media, for defamation over comments made by Shadbolt in four columns published in The Southland Times in 2014 and 2015. She claimed a number of defamatory meanings could be drawn from the columns, which discussed her position on council matters, including the council’s trading company Holdco and a proposed kākāpō display. The meanings alleged by Arnold included that she was dishonest, had leaked confidential documents, had colluded with a defunct ratepayers group and had acted inappropriately by engaging in debate about the “kākāpōrium” after declaring a conflict of interest. The jury found Arnold had proved some of the alleged meanings, but did not find any of these to be defamatory. However, after the verdict, the judge granted her lawyers’ request to make a court application to determine whether the verdicts for the first three columns were legally sound. Arnold is considering whether to appeal. Stuff editorial director Mark Stevens said he was pleased with the jury’s decision. “We always felt that at the heart of this case was the very important editorial principle of freedom of expression and it’s great for the industry and the craft of journalism to have this outcome”. Speaking outside the courthouse Shadbolt said he was “absolutely relieved” by the decision, which came three years after the statements in question. During the trial his lawyer had warned a decision against his client could have a chilling effect on political speech, however Shadbolt said the jury had sided with “freedom of speech and freedom of expression”. That working relationship must have changed after this. In his closing address, Stuff’s lawyer Robert Stewart asked the jury if the meanings alleged would be evident to a reasonable reader or to someone “who sees conspiracies that don’t exist”. Arnold’s lawyer Peter McKnight said the meanings were clear. He told the court Shadbolt “loathed” his client, that there was no factual basis for his statements and he was simply “out to give Karen Arnold some decent swipes”. The sentiment was denied by the Shadbolt camp. His lawyer Felix Geiringer said that while it was true the pair did not “get on”, he was within his rights to criticise her and otherwise he was giving his opinion on local political matters. Some big name out of town lawyers there. It won’t have been a cheap trial for any of the parties. Arnold alleged Stuff was irresponsible and reckless in the way it published the columns, in part because only one staff member – long-term Southland Times features editor Mike Fallow – checked them without referral to editor Natasha Holland or a lawyer. This, in McKnight’s reckoning, was “totally irresponsible”. However, Stuff’s chief executive Sinead Boucher said she would have personally published the columns and the checking process they went through was appropriate for a modern news organisation. Geiringer told the jury freedom of speech was particularly important in this case. He argued there would be a chilling effect on political speech and publishers’ willingness to provide a platform if the jury found against his client. Their decision would have, he said, a “substantial impact on the society we live in”, whereas McKnight contended it was “very important that we as a society protect the reputations of politicians from unwarranted attack”. There is a well known precedent that specifically applies to criticism of politicians. The case provided a basis for the Lange defence – a legal precedent that allowed news organisations to report harsh criticism of politicians, provided they were not reckless or motivated by malice – to apply not just to parliamentarians, but local body politicians. In the October 1995 issue of North and South magazine, political scientist Joe Atkinson suggested that former Prime Minister David Lange had been too lazy to take on the difficult aspects of that job. 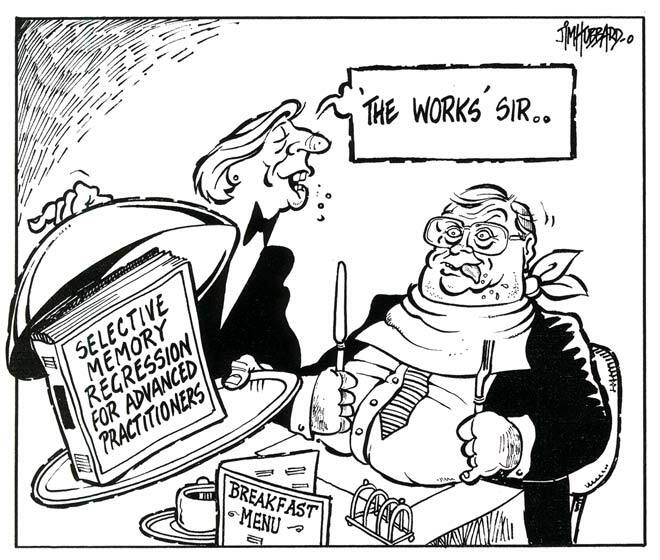 The accompanying cartoon played with the article’s suggestion that Lange suffered from ‘false-memory syndrome’ in his portrayal of himself as prime minister – as well as his comments about hotel breakfasts in New Zealand. Lange considered the article (and cartoon) to be defamatory and took Atkinson to court in 1996. After the case went through a series of courts, the Court of Appeal eventually decided that journalists had a defence of ‘qualified privilege’ – meaning that they could criticise politicians on the basis of their ‘honest belief’. The findings in the case have given New Zealand media greater freedom to comment on the performance of politicians. The Southland case is different in that it was a councillor versus the mayor. There’s been a number of people who have only recently been elected to local body councils talking about putting themselves forward to stand in the general election. Apart from the cost any by-elections will impose on the councils, this shows either a shoddy lack of commitment to a three year term they sought from voters less than half a year ago, or a cynical using of their positions as a stepping stone to national politics. here are some I have heard of just over the last couple of weeks. Maungakiekie-Tamaki Councillor Denise Lee hopes to bag a National Party nomination and replace outgoing Maungakiekie MP Peseta Sam Lotu-liga when he retires later this year. Lotu-liga announced in December he would not be seeking re-election of the Auckland seat prompting Lee to jump at the opportunity. She was re-elected as Maungakiekie-Tamaki Councillor last year after securing the majority of votes. “When you get selected twice as councillor, and the last time with the majority of votes, it is a good sign that you’re a good representative to serve the people well,” Lee said. A good representative doesn’t jump off their three year council gig after a few months just because of political opportunism. On Friday he announced he was planning to seek the National Party’s nomination for the Tukituki electorate, after 15 years as mayor or Hastings. A large number of locals, along with members of the National Party had encouraged him to run, he said. “I did not expect Craig Foss to resign, now I have to deal with that opportunity. I have been pretty humbled by the number of people who have approached me to stand. I think I can make a difference in Wellington, for the people of Tukituki, and for the National Party,” he said. Deal with an opportunity for himself and stuff the people who voted him as mayor, and will have to fund his ship jumping if he succeeds. Less than three months after becoming Wellington’s deputy mayor, Paul Eagle is eyeing up a seat in Parliament. Eagle said he was considering calls from Labour Party members to contest Rongotai, the Wellington electorate seat long held by the party’s deputy leader, Annette King. If he did contest Rongotai, he would stay on as deputy mayor – though he may drop some portfolios – but said there would be “a resignation immediately” if he won the seat. So he would ditch some of his council responsibilities to suit his own ambitions, essentially using his deputy mayor salary to tide himself through a national election campaign and only resign if how won the seat. How convenient for him – and inconvenient and expensive for his council. An $80,000 byelection could be on the cards for Nelson if two city councillors buzz off to the Beehive. Second-term councillor Matt Lawrey is the Green Party candidate for Nelson in this year’s general election, while third-term councillor Kate Fulton is still waiting to hear if she’ll win her bid for the West Coast-Tasman candidacy. If either win the electoral seats, or are placed in Parliament as Green Party List MPs, Nelson City Council will foot the bill for an $80,000 by-election. So Lawrey is already committed to being a part time councillor, part time general election campaigner. Councillor Matt Lawrey said it might be time to revisit the legislation that governs how city councillors are replaced. “[It] does raise questions, and maybe it’s time we looked at changing the system so in the event of a councillor dying or having to leave the role, the next highest polling candidate gets a seat at the table,” Lawrey said. But Lawrey is not “having to leave the role”, he is trying to switch jobs mid term because it suits him. A cheaper way of replacing councillors might help him justify his lack of commitment, but it’s not good practice. But Chief Electoral Officer at electionz.com Warwick Lampp said the legislation ensured fair process in cases where the next highest polling candidate received significantly fewer votes than the winning candidate. “I think you could legitimately argue that the community didn’t want that person and then they’ve [been given] them… It has to go back to the democratic function with a completely new election, where anyone can stand,” Lampp said. The highest polling failed candidate could have got hardly any votes. And it’s not very fair on candidates who put time and money into standing in the local body elections and just miss out for successful candidates to desert at their convenience. Are there any others who have announced their wish to desert their elected position just a few months in to a three year term? What’s up with Celia Wade-Brown pulling out of the Wellington mayoralty? Was she ever in it this year? Wellington Mayor Celia Wade-Brown has announced today that she will not be standing for election in the upcoming local body elections. “After 20 years of successful local government service, 6 years as Mayor and 14 years as a councillor prior to that, I am ready to move on and contribute to the community in a different capacity,” said Ms Wade-Brown. She then goes on to praise herself and Wellington City. After which there are a number of praising endorsements from a variety people that are more the sort of thing you would expect from someone campaigning for office. This seems late for the incumbent mayor of a major city to decide not to stand for re-election. Hat tip; Clayton Cosgrove to work for Phil Goff when he becomes Mayor of Akld. I heard that somewhere a while ago too, so maybe this is a thing. In April Cosgrove announced he wouldn’t stand again at the next election. He lost the Waimakariri electoratein 2011 and has been a list MP since. He said he wanted to take on new challenges and opportunities and was looking for opportunities in the business sector. He did not rule out resigning his seat before the election. Working for a mayor is not in the business sector. Working for an ex-fellow MP sounds like jobs for mates. I’m not aware of Cosgrove having much of a connection with Auckland. Lining Cosgrove up alongside Goff makes it look less like the independent bid for the mayoralty that Goff has tried to portray, and more like an attempted Labour Party takeover. Goff is probably still hot favourite to win the Auckland mayoralty but Goff + Cosgrove gives his opponents more of a shot. The acrimonious relationship between Dunedin City councillor Lee Vandervis and mayor Dave Cull continues with Cull being served legal papers on a Dunedin Street yesterday in defamation proceedings. This is a further sign of the degree of dysfunction in the Dunedin council. Dunedin Mayor Dave Cull is vowing to defend a $500,000 defamation claim, after being served with legal papers while walking down the street yesterday. Mr Cull was handed the documents by private investigator Wayne Idour near the corner of Bath and lower Stuart Sts yesterday morning. The documents related to a defamation claim filed against him in the High Court at Dunedin by Cr Lee Vandervis earlier this month. Mr Cull and Cr Vandervis were both reluctant to comment in detail when contacted, but both expressed regret the step had been taken. But one or the other must have not been reluctant to go to the media over the serving of papers, unless a reporter just happened to have witnessed it. It’s likely that someone went public deliberately. Mr Idour said when contacted he had planned to serve the papers on Mr Cull in the council’s Civic Centre building, but had seen the mayor passing by while sitting in Sugar Cafe. “I was in there, having a coffee and talking, where I go most mornings, and he was walking rather fast down Stuart St. I saw him and shot out. Mr Idour said he was acting as “process server”, under a barrister’s instructions, and not working for Cr Vandervis. Just a chance serving is possible but seems a bit unlikely. Serving the papers in public and then the media finding out seems a bit suspicious to me. The serving of legal papers was followed last night by Cr Vandervis’ decision to release a copy of his statement of claim to media. The document confirmed Cr Vandervis was seeking $250,000 in “general damages” and another $250,000 in “exemplary damages”, plus costs. The claim followed a heated exchange during a Dunedin City Council meeting last year, when Cr Vandervis claimed to have paid a backhander to secure a council contract in the 1980s. He was labelled “a liar” by Mr Cull and ejected from the meeting after suggesting he had given Mr Cull “personal evidence” to back his claim. In May, both men claimed a report by internal auditor Crowe Horwath, examining the backhander claims, backed their positions. Cr Vandervis then threatened to “double the damages” after Mr Cull stood by calling him a liar in the wake of the report. And this is where it has ended up, serving papers in public. The ODT understands the council had insurance to protect ratepayers from the cost of claims against elected representatives in their council duties, although it was not yet clear if a claim resulting from Mr Cull’s comments would be covered. Ratepayers could still be left to pick up the bill for associated costs, including legal bills, should Mr Cull lose, the ODT understands. Ratepayers pay in two ways – picking up some of the bill for this spat, and continuing to have a dysfunctional and acrimonious council. Both Cull and Vandervis have indicated they will be standing for mayor and for council again this year. But this reflects very poorly on both of them and on the Dunedin City Council. I think that this obvious and ongoing inability to work together raises serious doubts about the suitability of either for serving the public on council in either capacity. It’s time voters looked for elected representatives who don’t allow personal animosities to dominate their work for council and for Dunedin. Auckland mayoral candidate John Palino has released a manifesto book titled A Vision for Auckland (PDF) in which he outlines how he thinks he can make Auckland “the best city in the world”. Auckland has an amazing opportunity that many cities around the world could only dream of. While some may be opposed to growth, the alternative is far worse. So let’s take advantage of our challenge and make Auckland the best city in the world. In ways an aim of ‘best city’ may be admirable, but it’s an impossible overall goal – impossible to judge and impossible to achieve. The purpose of this book is to lay out a very clear choice between the current council’s strategy, which I am convinced is not working and will not work, and an alternative strategy I will put before you. I appreciate your reading this book and allowing me to paint a picture for you of my vision for Auckland. Most of those are fairly general political palaver. Will anyone believe that it’s feasible or possible to reduce rates by 10% in one term? A mayor doesn’t have the power to do what they promise in an election campaign. The full council votes on everything, so to achieve what the want a major has to win majority vote in the election, and majority vote for everything in council. So rates reduction and everything else Palino has in his book is aspirational rather than a promise. Palino will have to convince voters he can manage a mayoralty and manage the council, and have his say along the way. ‘Best city in the world’ is over the top unattainable. ‘Best candidate for mayor’ might be possible. Palino melting down: shouting, voice wavering. ‘I care about these people – I don’t play dirty. What ya looking at me like that for Rebecca? ‘There’s an awful lot of corruption In this town. If you want somebody to step up and get rid of it someone who is gonna tell it like it is”. Palino crowd heckling journos: ‘Wood from the neck up’ call at the esteemed David Fisher. Today, Mr Palino said Auckland ratepayers have faced massive increases forced on them by a wasteful council. “Since the formation of the Auckland Council rates have risen from an initial increase of 2.9 per cent to last year’s unprecedented 9.9 per cent. Many ratepayers have had increases far in excess of these levels,” Mr Palino said. “If elected I will institute a full review of council spending with cost savings passed on to ratepayers and redirected to essential ‘core’ spending,” he said. Mr Palino today set out his pitch for the mayoralty, promising to cut rates by 10 percent in his first term. It is his second attempt at Auckland’s top job, having lost to Len Brown by 50,000 votes three years ago. He becomes the third centre-right candidate, alongside one-time National Party candidate Mark Thomas and businesswoman Victoria Crone, who is backed by Auckland National Party figures. Veteran Labour MP Phil Goff launched his mayoral bid in November. Activist Penny Bright, rates campaigner Stephen Berry and former Green Party candidate David Hay are also standing. It’s getting crowded on the centre right. Slightly to the left of that Goff must be smiling. And Slater has put up a fairly predictable post – he’s promoting John Palino! They may be making their choices on a few more things than a promise that will be difficult to fulfil. Other candidates like Goff and Crone announced their candidacy and promptly went on holiday with no policy to be seen as yet. That was a mistake and one Palino has capitalised on. Palino may now wish he had gone on holiday today.